Hobby motors- every workbench warrior has a few that have been pulled out of broken toys or rescued from old electronics kits. They're cheap, available, and with Kinetic Contraptions, essential to build some ingenious moving creations. 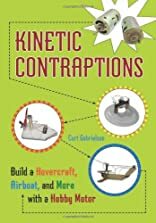 The two dozen contraptions found in this handy resource are assembled primarily from low-cost or recycled materials, batteries, and a single motor. You'll learn how to build vehicles that move across the land, over the sea, and through the air. Construct a hovercraft out of a Styrofoam plate, two corks, and binder clips. Build a double paddle-wheeler out of paint stirrers, plastic bottles, and disposable knives. 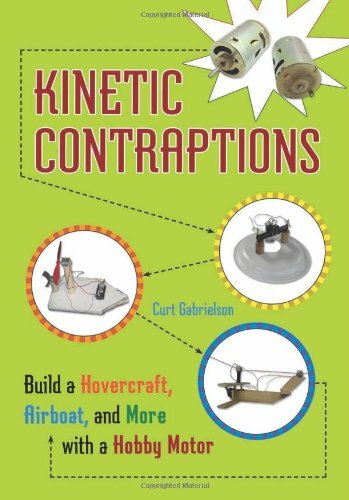 Kinetic Contraptions even has "bizarro" devices, such as a waterless snow globe, a tornado in a bottle, and a mechanical bubble maker- no blowing required! Each project is clearly explained through materials and tools lists, stepby- step instructions with photographs, and scientific background on the concepts being explored. Budding engineers will get experience working with tools, testing simple circuits, modifying and improving their designs, and building unique contraptions of their own with the skills they've developed.